DIY History | Transcribe | Social Justice | I.C. 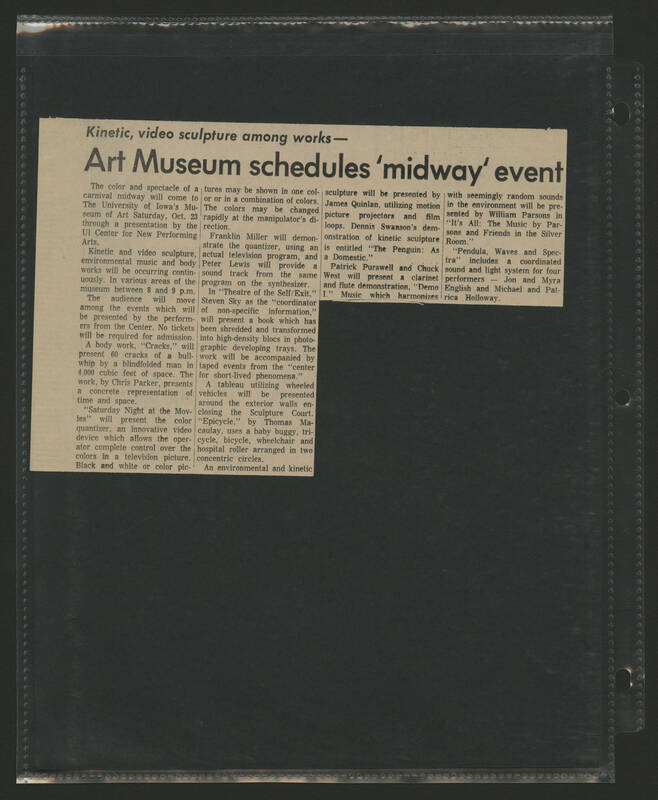 Notebooks 1 | ""Art Museum schedules 'midway' event""
""Art Museum schedules 'midway' event""
Kinetic, video sculpture among works -- Art Museum schedules 'midway' event The color and spectacle of a carnival midway will come to The University of Iowa's Museum of Art Saturday, Oct. 23 through a presentation by the UI Center for New Performing Arts. Kinetic and video sculpture, environmental music and body works will be occurring continuously. In various areas of the museum between 8 and 9 p.m. The audience will move among the events which will be presented by the performers from the Center. No tickets will be required for admission. A body work, "Cracks," will present 60 cracks of a bullwhip by a blindfolded man in 4,000 cubic feet of space. The work, by Chris Parker, presents a concrete representation of time and space. "Saturday Night at the Movies" will present the color quantizer, an innovative video device which allows the operator complete control over the colors in a television picture. Black and white or color pictures may be shown in one color or in a combination of colors. The colors may be changed rapidly at the manipulator's direction. Franklin Miller will demonstrate the quantizer, using an actual television program, and Peter Lewis will provide a sound track from the same program on the synthesizer. In "Theatre of the Self/Exit," Steven Sky as the "coordinator of non-specific information," will present a book which has been shredded and transformed into high-density blocs in photographic developing trays. The work will be accompanied by taped events from the "center for short-lived phenomena." A tableau utilizing wheeled vehicles will be presented around the exterior walls enclosing the Sculpture Court. "Epicycle," by Thomas Macaulay, uses a baby buggy, tricycle, bicycle, wheelchair and hospital roller arranged in two concentric circles. An environmental and kinetic sculpture will be presented by James Quinlan, utilizing motion picture projectors and film loops. Dennis Swanson's demonstration of kinetic sculpture is entitled "The Penguin: As a Domestic." Patrick Purswell and Chuck West will present a clarinet and flute demonstration, "Demo I." Music which harmonizes with seemingly random sounds in the environment will be presented by William Parsons in "It's All: The Music by Parsons and Friends in the Silver Room." "Pendula, Waves and Spectra" includes a coordinated sound and light system for four performers -- Jon and Myra English and Michael and Patrica Holloway.